His areas of expertise and clinical interests are refractive surgery, cataract and lens implantation surgery. He has made numerous local and national presentations and has contributed material to local newspapers and television stations. 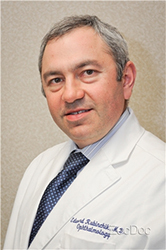 Dr. Rubinchik received his medical degree from SUNY at Downstate. He was a resident and a chief resident in ophthalmology at Brookdale University Hospital in Brooklyn, NY. Dr. Rubinchik’s mission is to strive for, achieve and provide the best care for your eyes. "You can expect the highest level of care and personal attention from your first preliminary check-up to your final post-operative visit." - Edward Rubinchik, M.D. 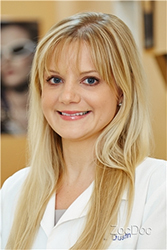 Lacey Dustin is a thorough and friendly optometrist working in New York, NY. She received her doctorate degree from the State University of New York College of Optometry. After school, Dr. Dustin completed additional training as an extern at Wenzhou Medical Hospital in China as well as Brooklyn Veterans Hospital in New York. Dr. Dustin practices with the Harlem Vision Center as an associate optometrist. She provides complete optometric care services, and her specialties include glaucoma management, diabetic ocular manifestations, post-operative care, refraction, and pediatric eye care. Dr. Dustin is a professional member of the American Optometric Society and the New Jersey Society of Optometric Physicians. She has been honored with numerous scholarships and awards in recent years, and is fluent in both English and Spanish. Call: (212) 368-2020 or visit us on ZocDoc. Recieve a FREE Anti-Reflection Coating!